Friends of mine who have spent time in Greece always remember to mention “the Islands.” They say that it’s a wonderful idea to use a few days to go island hopping. This just sounds like an excuse to hang out at the boat, and that’s what vacations are all about. 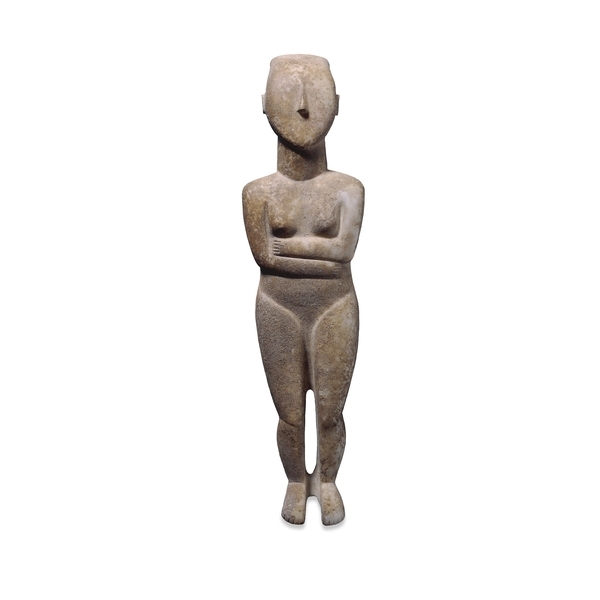 But there is something else besides cheap lager and stomach problems the islands have to offer, and this is of course the old Cycladic culture that left us, among other things, these weird figurines. I’m told that the ones I saw in the British Museum follow something called the Keros-Syros schema and so does the one I saw in the Louvre not long ago. 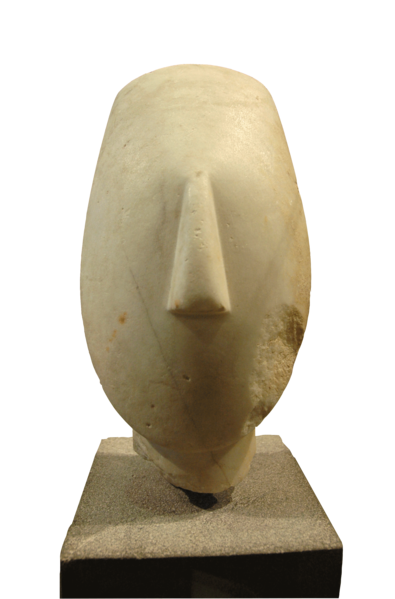 However, it’s difficult to see the similarities in the Louvre’s Cycladic head, and not only because dating these things has a lot to do with the way the arms and the feet are positioned. In any case, there is a rather complicated path of development for dating, illustrated below in a picture I borrowed from Current Archeology. The shape of the heads seems to indicate that the Louvre head is a bit older than the one above and this other one from ca. 2700-2500 BC. As you can see below, the Louvre head has a much narrower top than the other ones and given our little evolutionary scheme it should be no surprise that it could be from as far back as 3000 BC. Of course, I know next to nothing about dating old marble statuettes and hence all this might be just empty drivel. For instance, the fact that the Louvre head is from a much larger statue (estimated about 140 cm) could make all the difference in its head shape. Maybe the shape has been made to accommodate the viewing angle, or maybe the sculptor had only a small piece of marble for the head. Experts have probably figured this out and while they’ve been out doing that, I’ve been trying to get my head around the four or five thousand years that separate the sculptor and myself. These things were definitely painted and you can see that there’s room for great big eyes that must have been pretty impressive, but all other details seem to have faded over time. The heads were supposedly a great inspiration to Modernist sculptors and their simplicity was the thing that was most appealing to them. But who knows how these were tarted up with paints and other decorations. They might just be mere skeletal remains of something much more grand, goddesses in full regalia now stripped naked. There’s probably no way of knowing how the gods dressed so long ago, but it’s easy to guess why our modern times prefer simple ones.